#SW Default Set as "12 Mhz"
#Partitioning / GP Area Partitioning features added. #UI - Full Flash mode added. #UI - Partition mode added. #UI - Selection USER ( ROM1 ). #UI - Selection BOOT1 ( ROM2 ). #UI - Selection BOOT2 ( ROM3 ). 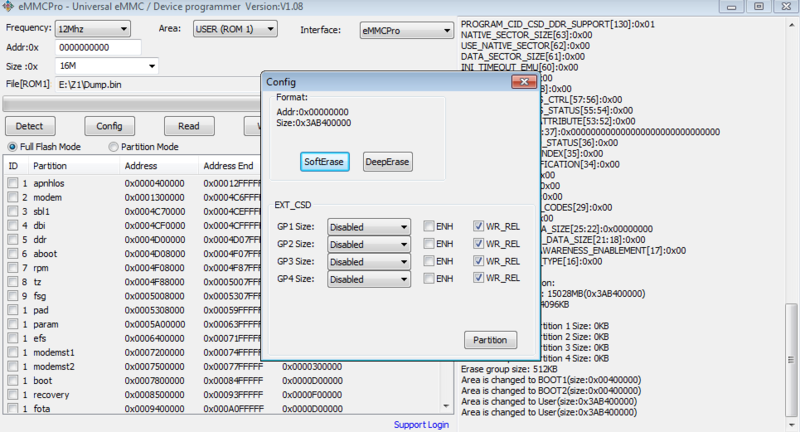 #UI - GP Area Partition Settings added. Provides a host explicit erase function. Erase group is measured in write blocks which are the basic writable units of the Device. as if it was overwritten with all ‘0’ or all ‘1’ depending on the different memory technology. In addition to the Soft Erase command there is also an optional Deep Erase command. requires the device and host to wait until the operation is complete. This should be executed the Deep Erase command with caution to avoid unintentional data loss. # Wipe failed on MTK devices will be easily fixed with this option. # Corrupt Disk not functioning will be solved such as Disks "not write protected" but devices can not be written firmware. only once in the device life-cycle. When the file is selected with Full Flash Mode . You are able to write the complete file as one and whole ! By selecting each partition and selected partitions will be written into target device . In order to comply among the eMMC Boxes and for easy understanding for our users . There is full access (R/W) and all the features are compatible with eMMC Pro. Complete identification of the eMMC will be displayed in eMMC Pro UI . but we recovered everything is perfect now .